I remember those commercials when I was young, Chia Head, Chia Pet, then they came out with cartoon chia’s. We were much too poor to get something like that, but my neighbor friend had one. I remember watching the seeds grow in her kitchen window. That had been my only interaction with chia seeds until probably a year ago. In fact this blog doesn’t even recognize the word and is telling me to change it to China, LOL so let me introduce you in case you also don’t have much knowledge of this tiny little miracle seed. Chia seeds are very small but pack quite a punch. In fact they contain more antioxidants than fresh blueberries, more omega-3’s than Atlantic Salmon, more calcium than 2% milk, more protein, fiber and calcium than flax seeds (thanks to http://www.thechiaseed.com/ for this info). Chia is also a complete protein unlike MOST vegetable sources, you don’t have to add anything to them to make them complete. I have read in multiple sources that Aztec and Mayan men would take chia seeds with them to battle. 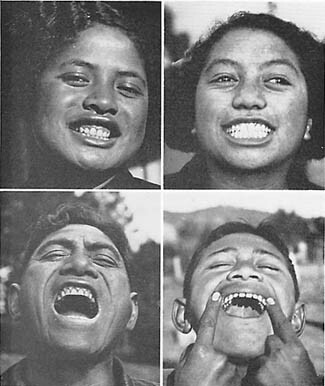 They were small and easy to carry and they would take a teaspoon of them for energy. I think I found chia seeds from my herb source mountainroseherbs.com (I love them because they are in Eugene, Oregon and I’m in Oregon so it just seems right. Oh and the fact that they have amazing prices and give you discounts on multiple pounds that you buy helps too). I was getting on a sprouting trip. I bought chia along with alfalfa seeds to sprout. It wasn’t until AFTER I got the seeds that I noticed the chia wasn’t washing clean like the alfalfa seeds. They had this…gel. I contacted Mountain Rose and finally the mystery was solved, this is normal and you don’t sprout chia seeds like you do others. Well… great. Now what am I gonna do with a pound of these seeds if I couldn’t use my sprouting screens? So research began and I found chia seed pudding. 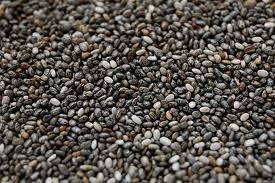 Chia seeds soak up 9-12 times it’s weight in water, depending what site you get your info from. Some sites say to add 2 cups water to 1/3 cup seeds, some say 3 cups water to 1/3 cup seeds, I usually wing it. I also don’t use water, I make a fruit “syrup” out of frozen fruit we have. Mostly I do blueberry and elderberry or a combo of both, simmered in water to release the fruit juice. Then I add a sweetener sometimes sugar, sometimes honey, sometimes stevia, sometimes syrup. This past batch I made elderberry juice with stevia to soak the seeds in, added the seeds and let them plump up to the gel stage. Then I added some organic cranberry maple syrup we picked up at a discount store (Grocery Outlet). The addition of the syrup made this batch extremely good. You do have to make sure they are covered in the fridge because they do dry out if left uncovered. I’m a use-what-you-have type of person, why go waste money on buying something specific when something else would work that is already at home? So if you have apples, use apples, if you have juice in your fridge, then use juice. We call it chia pudding in our house but that’s only because it’s like tapioca in a way. Each chia seed has a gel around it that swells up with whatever liquid you use. So it has a “pudding” like feel. You could use milk and make pudding too if you want, your imagination is your only limit here. I take a bunch to work and use it as a pick me up in the afternoon. 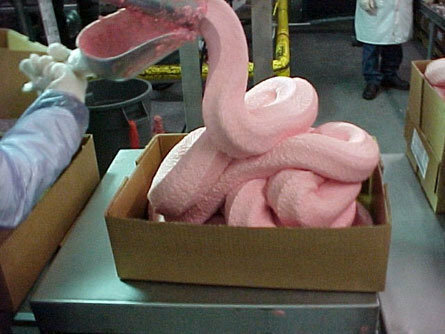 I’ve eaten it for lunch, had it as dessert after dinner and you don’t feel guilty for eating it! I’ve added fruit to it (Blueberries are so good!) and made it like a Jello fruit mold. Recently I found a bag in the cupboard, I haven’t done chia in a while and I started, I’m sitting here eating it at lunch today. It’s especially refreshing on a hot summer day which I can’t wait for, come on Summer! As for sources, there are a zillion places to find organic chia seeds. Mountain Rose Herbs, Naturalnews.com store has them, google them. I’m a proponent of saving money so find the best deal and go with it! I’m a 80’s child. I grew up on McDonald’s, boxed food like rice-a-roni and mac and cheese. Our vegetables came from a can or a freezer bag. What I think parents forget is that they are teachers, they teach us how to eat, how to act, how to react, how to clean, how to drive etc. When we learn to cook from boxed and can foods, that is all we know. When we grow up on margarine, what do you expect us to buy when we are adults? So let’s just lay it all out there. I’m a 30-something married woman, who learned to eat junk and thus I am over weight. There was no garden to go pick fresh food from, honestly I was just as ignorant as to where my food came from as most of these kids you see on shows like Jamie Oliver’s Food Revolution. 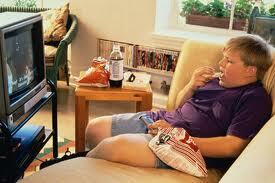 Kids are obese because we quit giving them REAL food. I am obese because I learned to eat junk (box food, ding dongs, candy, mac and cheese). So when times get hard, what do I fall back on? Food that doesn’t nourish my body. I am pre-diabetic, and only because I have PCOS. Which is a fertility issue as well as insulin resistance issue, thus putting me at risk for diabetes. Does that scare me? Yes. Have I done enough to change things? No. Just being real here. I am not sure where I heard this, either a blog or a sermon recently, but we are taught that God is in us right? The Holy Spirit lives in us. What are you feeding God? What are you putting into God? Now, let me stop here and say I DO NOT believe in any way shape or form that I am God. I also don’t buy into the New Age garbage that we are all part “god”. I am no God, I am a sinner saved by grace ONLY. However God does tell us this body we have here is our temple, right? 1 Corinthians 6:19-20 19What? know ye not that your body is the temple of the Holy Ghost which is in you, which ye have of God, and ye are not your own? 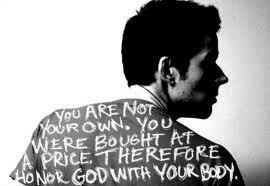 20For ye are bought with a price: therefore glorify God in your body, and in your spirit, which are God’s. I think most people take this to be don’t drink, don’t do drugs etc. These are all good things, but what else are we doing to our bodies that is not glorifying God? Margarine for example is horrible for us, it actually causes scarring of the arteries. Have you seen Super Size Me? 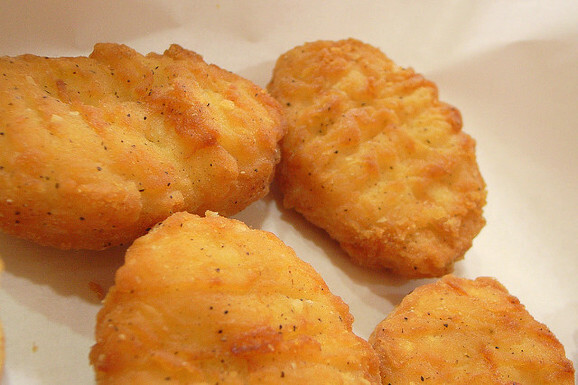 McDonald’s certainly isn’t something we should be feeding our temple. Canned veggies are not as nutritious as real, and the lining of the can has cancer causing things in it. What are we doing!?! Sitting on our duff’s eating while watching the idiot box (my grandma used to call the TV that, and it certainly fits) is not doing anything to glorify God with our bodies. Don’t even get me started on the TV, movies, and things that we put in our body visually… that will be another post. Is God stupid? I mean he created eggs WITH yolks. 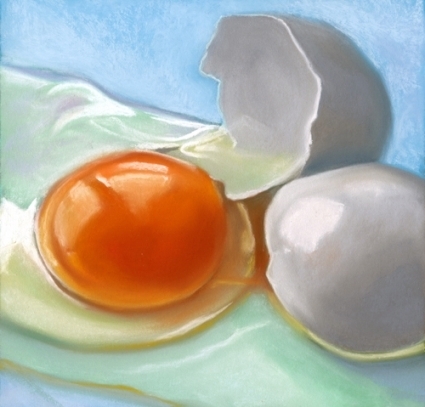 But now shows like The Biggest Loser tell us that the yolks are bad for us and what is making us fat and have heart disease. They tell us that all forms of fat are bad for us, this isn’t true, our bodies need fat. Do we need hydrogenated artery clogging oils? Not one bit. Do we need naturally occurring oils like coconut and fish oils and flax-seed oils? Most certainly. Do we eat eggs? yes! The whole egg. Do we need Vanilla Latte’s? No. 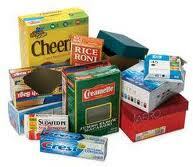 Do we need boxed processed garbage? No. Why is disease and cancer getting crazy out of hand? Because we forgot what real food is! Tomatoes come from a vine, not a can. Peas grow on a vine too and they don’t come out of a plastic frozen bag. 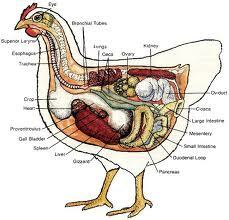 Chickens should be able to run free and eat bugs and then they lay you beautiful NUTRITIOUS eggs. When we started keeping chickens I was almost sick to see the difference in yolk color. Real eggs are bright and vibrant, they are dark in color, not this light yellow junk you get at the grocery store. These days all you have to do is look a little harder than the grocery store to find true nutrition. Farmers Markets, Craigslist, even realmilk.com are all wonderful places to find real whole foods. BTW, I am an advocate of raw milk, God didn’t create pasteurized milk. We drink raw goats milk that we get from a friend. Some states, including my own, don’t allow you to sell raw cows milk for human consumption, but many people on CL (craigslist) will sell it for animal consumption but it’s perfectly fine for us to drink, as long as your farmer is clean and sanitary. Raw goat milk is legal to sell for human consumption here in Oregon… I don’t understand the difference. But we drank raw cows milk for years and still get raw butter. REAL butter. Even if you start with a natural grocery store, start buying organic produce, start growing a garden every year and teaching your children how to take care of their temple properly. When you eat an apple, eat the seeds. God gave us SEED bearing plants, why do you think he mentioned seeds? Because we are supposed to eat them! Seeds (especially apple and apricot) contain B17, which is an anti cancer vitamin that is found in the seeds. I encourage you to google search “A Life Without Cancer.” It talks about B17 and there is a Christian farm myfathersfarm.com which you can buy organic apricot seeds. My biggest fault is exercise, or a lack of it. Another life lesson we can teach the next generation, get out and move your body. Again, not something that was very prevalent in my growing up years. (although excessive dieting was, is it any wonder I am always looking for the “next best thing” or the “easy fix”?) So here’s my suggestion, why don’t we start a taking back of our temple movement? Why don’t we start thinking about what we are feeding God rather than what will satisfy the emptiness/sadness/depression or whatever you are feeding? Some of us had some real stuff happen to us, some of us were abused (in all it’s forms) or teased. Some of us have some stuff we need to let go of and let God handle. Pray on these things, ask God to turn it around, ask God for healing. And don’t think you are alone, we all have worldly baggage that we have allowed to bog us down for way too long. Don’t forget that we serve the creator of heaven and earth, he can move the whole earth for you. He loves you (and me) enough to die, to suffer and die, to be ridiculed by his own creation, all so he could save it. All out of love. 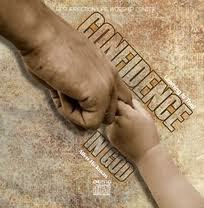 If you struggle with self-confidence (as I do) remember how very special you are to God. If you weren’t he wouldn’t have died for you, he wouldn’t have gone through all he did so that you could be with him for eternity. He would have just let you die and go to the place he made for Satan and his angels, hell. But he didn’t, and his love for us is bigger than any of us can imagine. You are special to God. So what do you say? Are you ready to take back your temple? Are you ready to allow God to work in your physical body? Are you ready to say no to your flesh (aka McDonald’s etc) and yes to God being inside you? Are you ready to fill your temple with good God-given foods, to give it nutrients and life, rather than poison and death? Please join me in taking back this temple for God’s glory. And there is no better day to start than today, than right now… isn’t God worth that?